This 50m premium grade 16 AWG gauge pure copper speaker cable is designed specifically for in-wall and in-ceiling installation. Digihaus only uses 100% OFC copper for perfect sound reproduction. 16 gauge speaker cable is perfect for most premium home-theatre setups and popular for rear and ambient speakers in professional setups. Durable exterior slide jacket for easy installation. Professionals know that wired speakers clearly outperform equivalent wireless speakers. This speaker cable is the highest quality standard ﻿speaker cable on the market. It is a heavy 16AWG gauge pure hi-fi oxygen free copper (OFC). It will not compromise the audio of even your very best speakers, and it is ideal for supporting speakers at long distances. Its bright pink fire retardant PVC outer jacket protects it during installation, is fully fire rated for complete safety, and is alerts electricians to keep their power cables away. Pure OFC Copper - This cable has two (2) 99.9% oxygen-free copper 16AWG conductors, 1 coated red and 1 coated black. Each conductor has 65 copper strands. The kind of quality you get from this cable assures you that you can leave it in your wall and expect the exceptional performance on your speakers, as opposed to the inferior performance you can get from some cheaper cables that are only copper coated strands. 16AWG for standard performance - 16AWG is regarded as suitable for most domestic home theatre setups with no detectable effect on audio over 15 metre distances to a typical 8 ohm speaker. 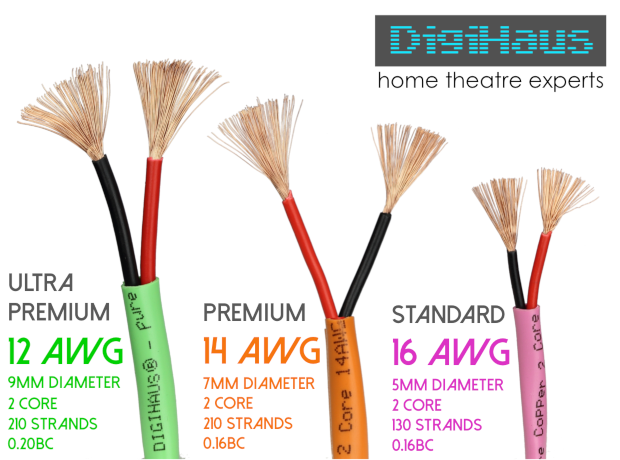 The thicker 12AWG cable is recommended by Digihaus® for lower impedance speakers and longer distances. It will ensure your audio quality is not compromised by the speaker cable. See more information on recommended maximum speaker cable lengths by guage here. ROHS Compliant- It is fully RoHS compliant, meaning the manufacturing process is entirely environmentally friendly. Designed for in-wall installation - the heavy duty easy slide PVC jacket will protect the cable during installation. It is easier to pull through cavities and affix to building structures and the extra protective thick coating and internal rip cord helps protect the internal conductors from stretching, tears and accidental damage. The 2 x 65 strand conductors provide the perfect balance of strength and flexibility for in-wall installation. High visibility - professional home theatre installers will remind you to keep speaker wires away from power cables and other sources of electromagnetic interferance. The super bright colour of the PVC jacket ensures that it is highly visible when installing in your walls and ceilings. Electricians will know to keep their other cables away. Fire retardant - The flame retardant PVC compound used in the jacket and conductor insulation is fire retardant and exceeds all local domestic requirements. It has a high temperature and combustion resistance, and low smoke and toxicity. In house fires, cable sheaths can act as conduits to spread fire within wall cavities, and often produce highly toxic gasses. Digihaus® fire retandant cables give you that extra protection to reduce fire spread risk and avoid toxic smoke. 10 Year Warranty- Digihaus® stands behind the superiority fo its products. Any defects are covered by a full manufacturer product replacement guarantee. It is always best practice to test the performance of your cable before any installation.